Be surprised, as you look afresh at the stories of some of history's most remarkable women, as imagined by the finest female authors of historical fiction for children. Be enthralled, as you encounter both famous figures and lesser-known heroines from across the ages from warrior queens to anti-nuclear activists. But most of all . . . be inspires. Penny Dolan, Adele Geras, Mary Hoffman, Dianne Hofmeyr, Marie-Louise Jensen, Catherine Johnson, Katherine Langrish, Joan Lennon, Sue Purkiss, Celia Rees, Katherine Roberts, Anne Rooney and Leslie Wilson. 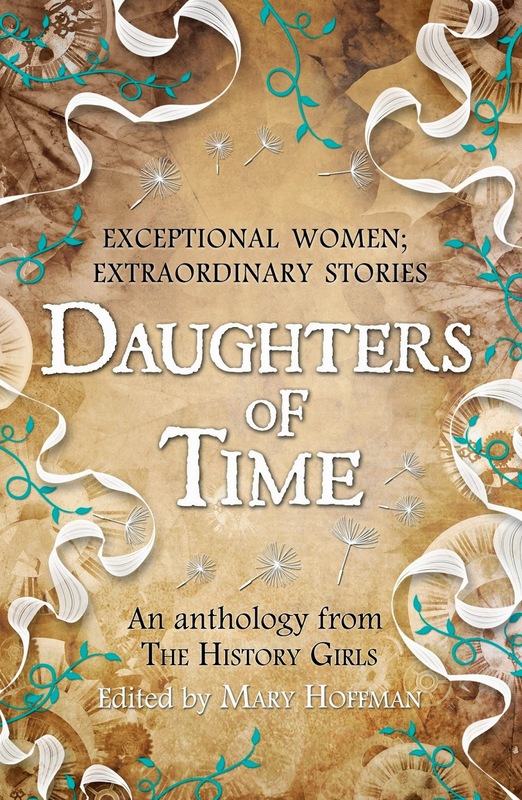 Daughters of Time is an anthology containing thirteen stories about extraordinary women throughout history, some you will have come across before but also more than a few who you've probably never even heard of before. After each story there is also a short note from the author explaining what inspired them followed by some true facts about the historical figure they wrote about. The anthology has stories ranging from approx c.30 AD right through until the 1980's so it really does span the ages. It's not often you come across such a variety in one book so I really enjoyed dipping in and out of the different eras that it covers. You'll find stories about warrior princesses and queens next to stories about famous female writers and campaigners for women's rights. Not to forget a pilot, a nurse and an archaeologist! What I enjoyed most was getting to learn something about women who I'd never even heard of before, I'm definitely going to have to do some research now to find out more about them! Daughters of Time is a fab anthology for anyone who is interested in history, especially if you want to learn more about some of the women who have had a huge impact on society throughout the ages. Source: Received from Templar in exchange for an honest review. Thanks to Templar I also have this extract from Sue Purkiss talking about why chose to write a story about Aethelflaed for her contribution to the anthology.